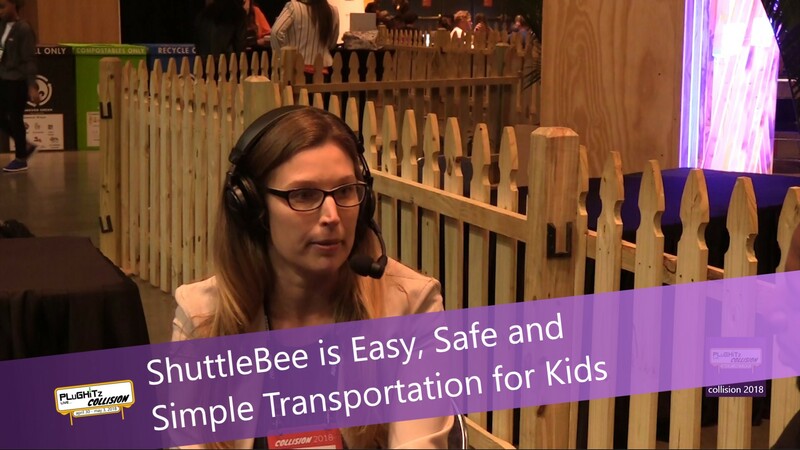 ShuttleBee is a tech-enabled transportation service for kids. A what? No, you read that correctly. And founder, Kristina Fahl, stopped by our Collision 2018 studio to explain how this idea really isn't all that far-fetched. In a nutshell, they take kids from one place to another. And we admit when you first hear the concept, one of the first things to come to mind is... I would never put my children in a rideshare vehicle alone. But then when you really think about it, we do it all of the time, with friends and family, on school buses and in daycare vans. And certainly without all of the ingenuity and safety features that come built into ShuttleBee. This platform offers brand new options for getting your kids to school, activities, and events. They are fully insured and operate with strict protocols designed to keep your kids safe. Their drivers and walking supervisors are our well-vetted and the routes are always monitored. We are all caught up in our own hectic lives. Juggling multiple balls to keep everything running as smoothly as possible. But inevitably, life throws us those monkey wrenches that can be tough to dodge. From getting the kids to school while not missing those early morning meetings to needing to get different kids to different activities in different parts of town. We can all use an extra hand (or car) from time to time. And you definitely will not have to worry about them not being "in your sights" while they are riding. Services include a Route Supervisor who is immediately available while the kids are in transit. There is also instant message via chat included as well as GPS monitoring. And if you're like us, you'll have that up during the entire ride. There are three ways to use their services. Whether you need to use them on a regular basis, or as the perfect back up plan, ShuttleBee has a plan for you. They offer Group Transportation, have Hourly Rates and also Custom Chauffeur/Event Services. All are great options to safely get your kids where they need to go. The Group Transportation is for parents who are looking to set up daily transportation for their children. ShuttleBee works with them to match their kid's travel plan with other children heading in the same direction. They consider it their most cost-effective plan. The Hourly Rate plan is for parents who are looking to book a group by minivan or daycare bus routine service or things like single field trips or events. This option makes it easy for the cost to be divided among riders if needed. Lastly, the Chauffeur Service is perfect for specific appointments or those early-mornings work meetings that keep you from being able to drop the kids off at school. This service will offer routes that are competitively priced and include in-vehicle video monitoring. If you would like more information about this unique and convenient service, make sure to check out the full interview and then head over to their website for more specifics and updates.